It's time for another in my series of "I eat it so you don't have to" posts. 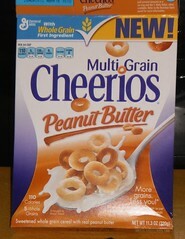 When I saw that Cheerios had come out with a peanut butter flavor, I was thrilled. Peanut butter is my second favorite flavor, after chocolate, so this is going to be exceptional. I'm of the age where I remember the hullabaloo over Honey Nut Cheerios. What did General Mills think they were doing to the best cereal ever? Honey Nut Cheerios took off and possibly opened the floodgates for other iconic cereals to experiment with flavors. Looking at the Cheerios web site, there are 13 different flavors of the cereal. Thirteen. Their marketing plan involves pitching Cheerios as a flavor for everyone. They have multi grain, apple cinnamon, banana nut, chocolate, dulce de leche, cinnamon burst, frosted, fruity, oat cluster and yogurt cluster in addition to the regular, honey nut and peanut butter flavors. If I want something a bit different in Cheerios, I get the fruity ones. Now those are good. I was disappointed, very disappointed, in peanut butter Cheerios. When I opened the box, there was strong whiff of peanut butter. But once you add milk, the flavor is merely hinted at. The predominant taste is the multi grain. The smell of peanut butter is there but the taste, not at all. I really wanted peanut butter. This is a suggestion of flavor. These weren't even good for snacking during World of Warcraft raids. I won't be buying these again. Chocolate Cheerios don't really appeal to me, but I'm thinking I should check all these flavors out, for science, you know. What I recommend is buy a yellow box of the real thing and make yourself some peanut butter toast to go with it. A bite of Cheerios, a bite of toast and viola. You have the peanut butter taste they should have created.